Estimate your ship time: Enter Zip Code. and neck, while a top layer of cooling gel reduces heat buildup. 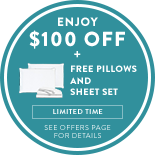 "The material is dense and offers me more support than any other pillow I have experienced. 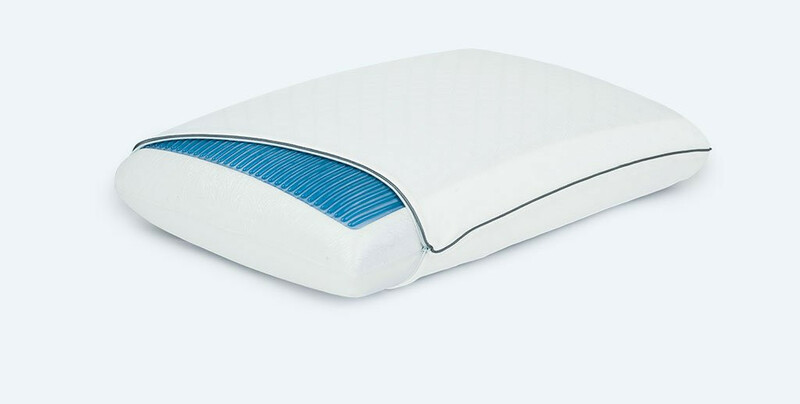 Most pillows give out and flatten after a few minutes, this pillow stays firm and supportive." "I recognized an improvement the very first night: my sleep is more restful and undisturbed. The Sealy pillow is more comfortable than what we'd been using before. I'd give it a 5 star rating." "My absolute favorite part of the pillow is the cooling. It always seems to be the perfect temperature. After years of turning pillows over I couldn’t be happier!" This bed changed the way we sleep. It’s supportive for both of us but also just cozy. You sink in just the right amount. And it’s quiet—we don’t disrupt each other if we move or get up. We love our Cocoon. It’s been perfect for us. It was crazy getting the Cocoon, especially because as you unpack it, you quickly realize it’s such a substantial and high-quality mattress. We were a little blown away. Getting married to (my husband) Dan, and moving into a new place, it’s been really fun to bring our things together. Our bedroom has a little bit of both of us. Every piece in the bedroom has a story. And there’s nothing like a cozy bed to get into at the end of the day. For me, it’s really important to have a choice because it can be very hard to find the right mattress. I chose ‘firm’ because I think it’s better for my back and allows me to stay still at night. It’s dense. When I first got it, it just felt well made. I guess when you’re making something for over 100 years, you figure out how to make it right. I’m very much a minimalist, so when it comes to the place that I lay my head, I like to keep it as simple as possible. The bed and a sleep schedule are the most important things for me. But the art, photos, paintings that I keep around are reminders of how important it is to constantly be creating. I’m a very aesthetic person, so when we got our Cocoon I immediately noticed the clean lines and beautiful design. I love the stitching. It’s the first time in my life I’ve thought ‘oh my God, this mattress is beautiful .’ But it’s also just amazingly comfortable. I LOVE our bed. My life is so busy and scheduled—I’m running around all day long. My bed is my favorite place on the planet because it’s the one place where I can be peaceful and calm. Nothing makes me happier than curling up in my bed and reading a book. But it’s also where we spend lazy Sundays when we have a family ‘cuddle puddle’—in pajamas all day, watching movies and just being together. That’s my favorite thing! Our first impression was 'how can something of this quality come in a box?' But they've mastered it. They’ve figured it out. Getting the bed was just as momentous as sleeping on it. You open it up, and it’s almost shocking. It’s top of the line. It’s super comfortable. Anyone can put a mattress in a box. But Sealy knows how to make a mattress, whether it comes to you in a box or not. We loved our old mattress, and we consider ourselves “mattress connoisseurs.” I’m telling you, Cocoon is a really, really good bed. Matt coined our bed the “clubhouse of comfort.” We spend a lot of time in our bedroom—I think more time than most It’s age old…your bedroom is your room. It’s a safe place, a place to be yourself. For us, it’s a hodgepodge collective of all the things we’re in love with.